M any first-time visitors to San Miguel choose to catch a flight to Mexico. When I first discovered my Mexican paradise in 1989, the closest airport option was Mexico City, a 3 1/2-4 hour bus ride away. That's still a viable way to get to San Miguel, especially if you're looking to save money on a cheap flight to Mexico. Flights to the capital are likely to give you the best bargain. But you can now choose to fly to León or even Querétaro—both considerably closer. There are many ways to save money on getting your body from your home Point A to your Mexican Point B. 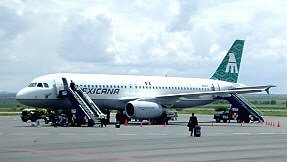 For some tips on flying to Mexico on a budget, here's a whole page on how to find a cheap Mexico flight. After you board your flight to Mexico, you'll be given the necessary customs and immigration forms on the plane so you can have them filled out before you deplane. On arrival, your first stop will be at the immigration desk. They'll check your passport and give you an FMT (tourist visa). If you're planning to stay in Mexico for six months, be sure to ask for 180 days. (If you have an FM-2 or FM-3 visa, you already know this drill and can stop reading.) You then pick up your luggage and take it to the customs line. The customs form lists what you may bring into the country duty-free. Most tourists will not likely be carrying anything not on the list. You can even bring in one surfboard—not terribly useful in San Miguel de Allende! The customs agent will take your form, point you to a light that looks like a stoplight and tell you to push the button. Green light—you go. Nothing more to do. You're done. Red light—you'll be sent to another area for a luggage inspection. It's usually fairly cursory, unless you look suspicious. The red and green lights are random, and there are more green than red. Just think green. All the major international airlines have regularly scheduled Mexico City flights. It is an extremely busy airport. A new international terminal opened in late 2007, very slick and nice, making your arrival easier. Once your flight to Mexico City lands, there are several options for getting from the airport to San Miguel de Allende. There's a bus station right inside the airport. If you arrive at the new Terminal #2 (probable), you'll go through customs then walk through a door into the general terminal area. turn right and within two to three minutes you'll walk outside to the bus station. Easier yet, hire a skycap to take you there and haul your luggage. Buy a ticket to Querétaro then go to the platform. The comfortable, air-conditioned bus runs every half hour. When you arrive in Querétaro about 3 hours later, you can catch a bus to San Miguel. However, it is far more convenient to take a taxi. There will be several parked in front of the bus station, quite happy to deliver you right to your door in San Miguel for about $30-40US. The ride will take a little less than an hour. Another option to is to book with Viajes San Miguel. On your arrivall, they will have someone waiting to meet your flight to Mexico as you come through customs in Mexico City. They'll take you to the airport bus station, buy your ticket and put you on the right bus. On arrival in Querétaro, they will meet your bus and drive you to your door in San Miguel. It's a very convenient option, especially if you're making your first visit to Mexico. Of course, you also have the option of booking a private car and driver direct from the Mexico City airport to San Miguel, the most expensive option. You can also take a flight to Mexico that will get you much closer to San Miguel. Nowadays, the most practical way to fly to San Miguel is to take a flight to BJX—León International Airport (which is actually in Silao, not León.) It's approximately 1 1/2 hours from San Miguel. There are shuttle services and private cars with drivers who will meet you as you exit the customs area and drive you directly to your door in San Miguel. Continental, Delta, American, AeroMexico and Mexicana all fly into León. It's a small airport, very easy to navigate. Most of the planes that land there are smaller, commuter-type jets, so you'll have to walk down the stairway and across the tarmac (shades of Casablanca!) Going through immigration and customs is extremely easy in this small airport and it's impossible to get lost. This option makes flying to Mexico as unstressful as possible. You can also now fly directly from the US into Querétaro, a convenient option for travelers from the Eastern part of the US and Canada or Europe. The flights go through Delta's Atlanta hub. They offer service five days a week, one flight a day, from Atlanta, Monday through Friday. That puts you just about an hour from San Miguel. You can get a taxi from the Querétaro airport to San Miguel for approximately $50US. Several airlines now offer flights from Querétaro to the U.S., including Delta and Continental. To compare flights, schedules and prices, you can check out kayak.com. They compare flights on more than 100 websites and consistently bring back the best prices, I've found. Find flights to Mexico from 100+ sites with one click. However you find and book your flight to Mexico, once you arrive in San Miguel de Allende, have a sit in the Jardín, sip your first cafe con leche and feel the Mexican sunshine on your face, you'll be so glad you came!